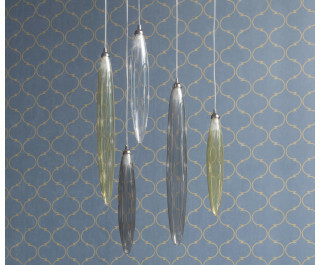 A hanging lamp sliding down your ceiling, like long rain drops, crystalized in an alternative dimension. The colors of light splitting on a watery surface, seem to be born to be mixed, combined, melted in their unique elegance. Founded by Gianni Tonin more than 30 years ago, TONIN CASA has been, since the very beginning, a perfect example of passion, elegance and research in the furniture business. In 1975 its main activity was the production of shoe cabinets and classical furniture, publishing the first catalog in 1982. Due to its success and the trust from our clients, at the beginning of the Nineties, we started our production of modern furniture, together with publishing of specific dedicated catalogs and the expansion to area beyond Northern ltaly. Since then, TONIN CASA has been in a continuous development and growing, engage into worldwide sales and exporting the values of "Made in Italy", with products which re-assume beauty and functionality. Signs and trends that promote the tradition of Italian Design in the world. TONIN CASA products are manufactured selecting trendy, refined and elegant raw materials, aiming to high safety standards and high reliability. In each new collection the coherence of language and shapes is always taken into great consideration. Essential goal for us is to always couple beauty and functionality, tradition and innovation, attention to details and cohesion between the different elements. Our creations have a totally original character. The harmony in the composition is for TONIN CASA a distinguishing element, capable to last in time, without forgetting that technique and materials are nothing, without the love for one’s own creations. Each single piece has its own soul: the soul of those who chose it for the home. TONIN CASA knows that, in order to create products compatible with human passions, it is necessary to create an environment of wellness, starting from the source of its creation: its own location. Located in the Padua area, TONIN CASA’s headquarter, with its balanced and comfortable spaces, is the cradle of the company’s creativity. The structure includes, in a perfect and functional synergy, the administrative dept, our artisan labs, warehouse, style-centre and showroom, one for classical and one for modern furniture. From the creation of prototypes, up to the final finishing and stocking, the whole life cycle of products is coordinated and organized by people, for other people to appreciate. Even in its headquarter, TONIN CASA has decided to follow its own philosophy: to create quality products, capable of living amongst people.